Chrome U-Bar Style LED Halo Headlights 09-18 DODGE RAM Anzo Chrome U-Bar Style CCFL Halo Headlights 09-18 DODGE RAM, Chrome U-Bar Style CCFL Halo Headlights 09-18 DODGE RAM, Chrome U-Bar Style Halo Headlights 09-18 DODGE RAM, Chrome CCFL Halo Headlights 09-18 DODGE RAM, Chrome Halo Headlights 09-18 DODGE RAM, [Anzo 111269 Head Lights] - $509.95 : 3rd Strike Performance, Your Source for Late Model MOPAR Performance Parts and Accessories! These lights are built to be ultra-bright so that they can be seen in both light and dark environments during the day and night. If you want to be able to use your halos all the time, you should choose LED. These rings are also slightly more durable than CCFL and are built to last for 60,000 hours of continuous use. Anzo projector headlights are among the finest lighting products in the industry. Known for their good looks and superior brightness, you'll be sure to enjoy the new look your Ram will get when adding a set. Projector headlights produce a much stronger and brighter beam than stock headlights and gives your ride a more modern look. Installation is easy using a plug and play design, each set of headlights is custom fit to be a direct replacement of the factory light housing. High and low beams light using basic halogen bulbs while the center halo ring utilizes CCFL technology, which features a brighter, clear light compared to LED style halo rings. 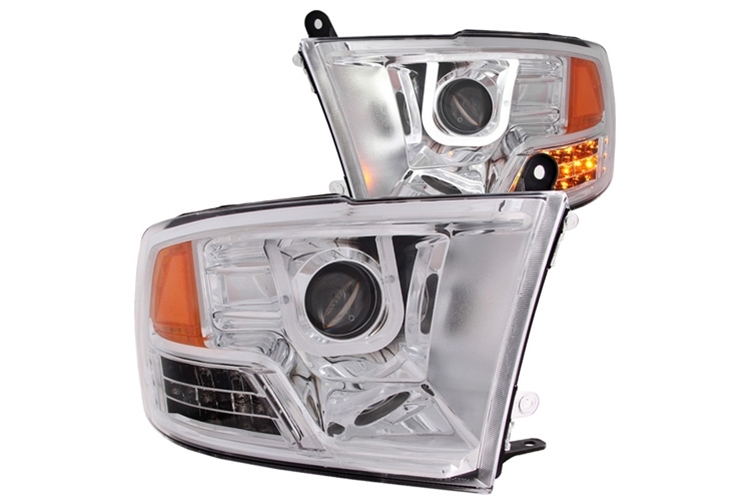 A new custom set of Projector Headlights from Anzo USA are the perfect accessory for your Dodge Ram. Order your new set and turn your truck from ordinary to extraordinary with one simple bolt on accessory. The first thing anyone sees of your Dodge Ram is the front so it only makes sense to put the very best on it so choose the quality and craftsmanship of Anzo USA.